It appears Doris and Daniel have resolved to become friendly exes and remain cordial for the love of their child, David. Doris and Daniel, who met on set of the Daniel-directed Omo Jaiye Jaiye in 2006, welcomed a baby boy together in April 2008 before having a bitter split in 2010. 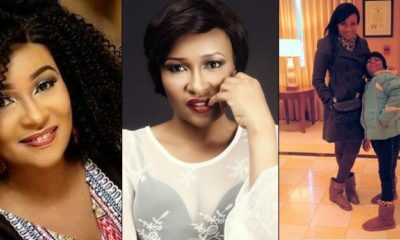 They had a rocky relationship after Daniel moved on to fellow actress, Stella Damasus. It was alleged at the time that Daniel had seized their son and stopped Doris from seeing the boy. ”Spent the entire weekend buried in a studio editing but I had to come up for air for THIS. Don’t believe everything you read on blogs. They’ve gotta stay sensational to make a dollar. ??. It’s all good in the Hood”. i am so happy for Doris.